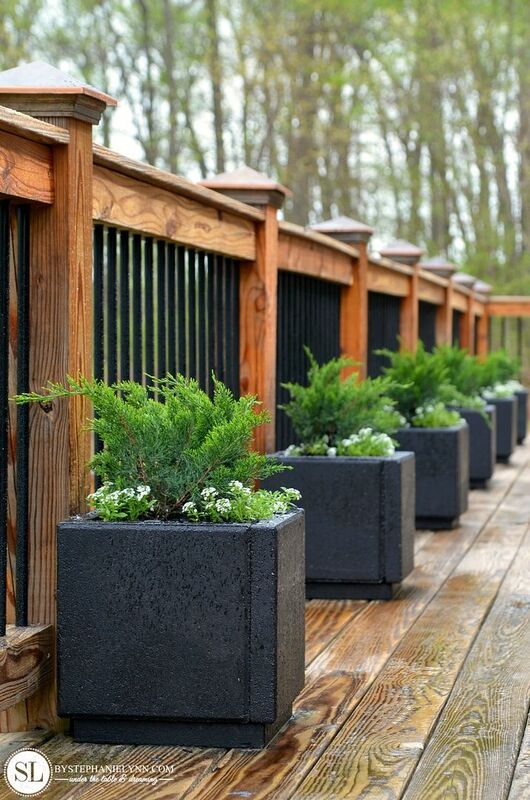 No matter where you live or how much space you may have, the simple addition of container plantings can instantly make any outdoor space feel cozy and inviting. 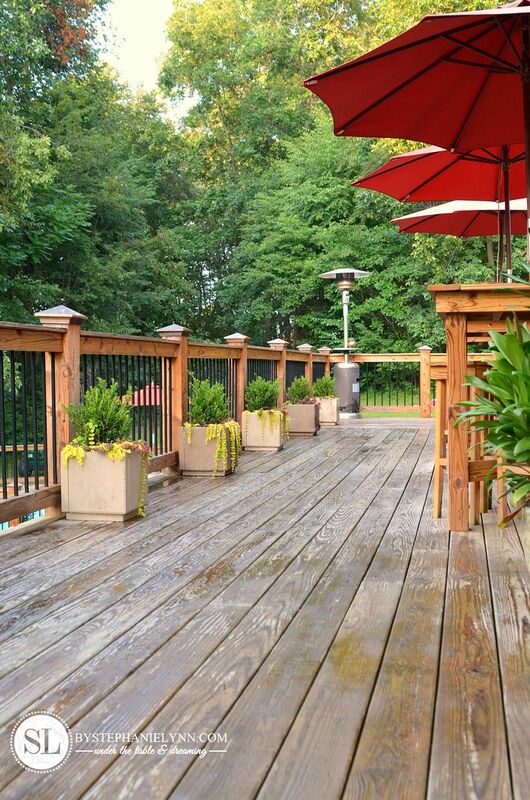 This time of year our deck transforms into a much-used outdoor extension of our indoor living space. After all of the cleaning, maintenance and staining is done – plants and flowers are one of my favorite – and one of the easiest – ways to decorate the space. 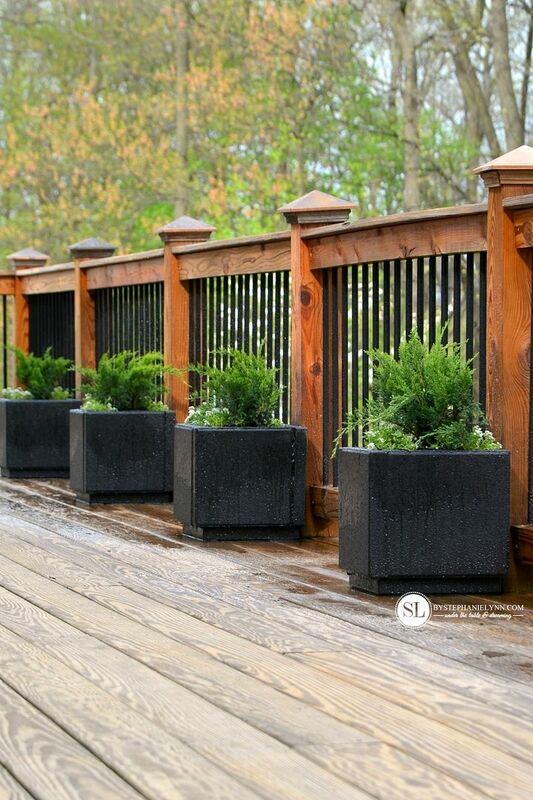 Adding a series of container plantings was one of first projects we tackled once our deck was complete. 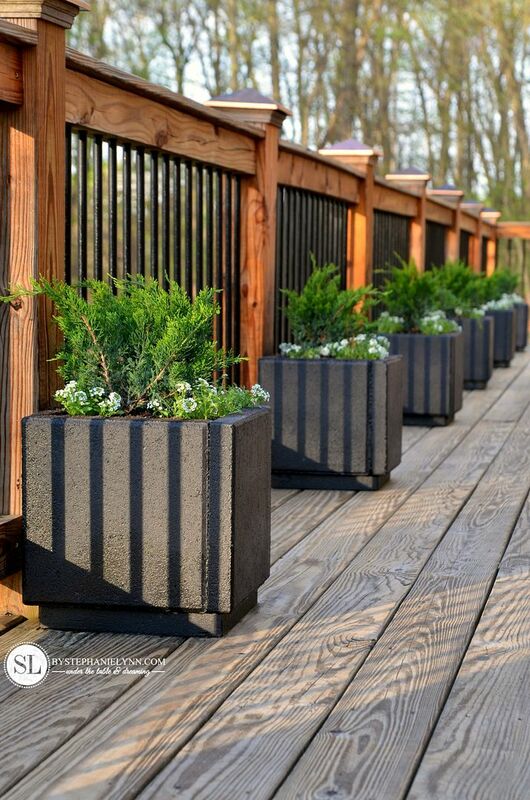 We built these simple diy Patio Paver Planters over five years ago and they continue to add life and set the tone for our deck decor year after year. and run about $6 a planter. 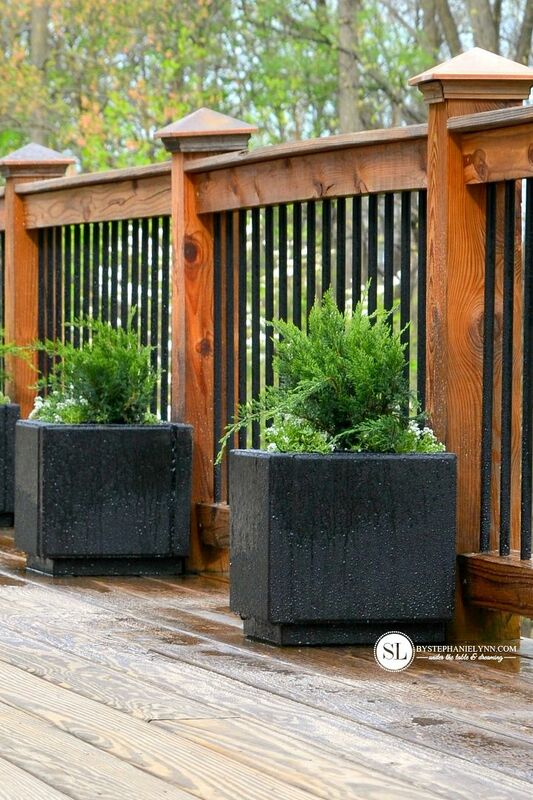 They are very durable and sturdy – and can even withstand harsh freezing temperatures. 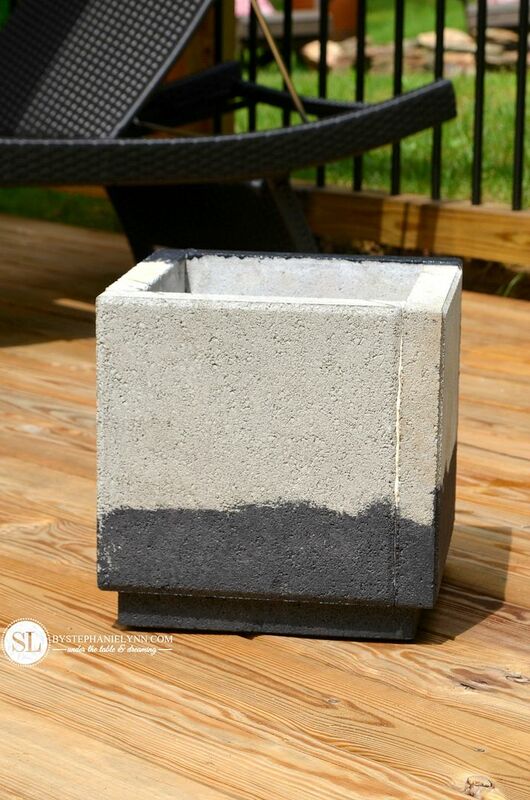 The Patio Paver Planters can be painted any color to match your outdoor decor. We recently gave all of our planters a little update and painted them all black. and tinted any color you prefer. Only the outside and top lip of the planters were painted – leaving the inside natural stone. Over the years we have had a variety of plants in the planters. I have enjoyed using a mix of perennials and annuals, though my favorite is compact shrubs. I love evergreens in particular, as they provide color and interest to the planters year-round. 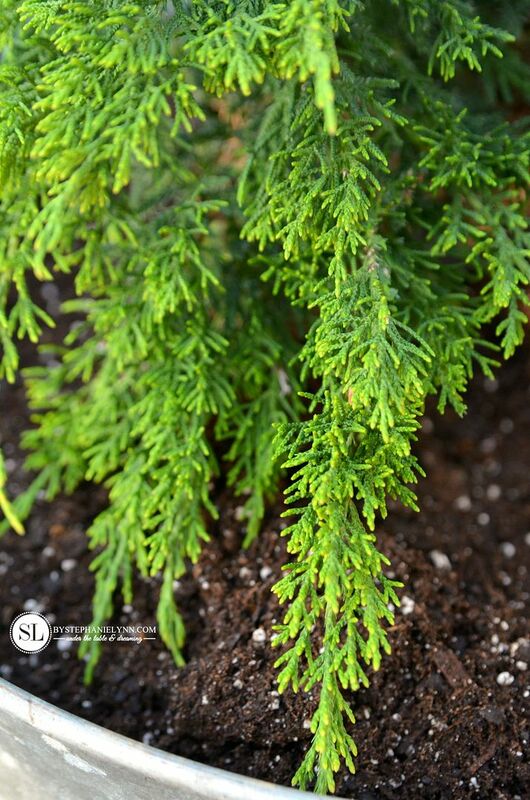 When selecting container plants I always look for small, compact, slow-growing shrubs or evergreens. These are typically re-planted every other year to accommodate the root growth. Another reason I love using perennials and shrubs in containers – as once they have outgrown the planter they can be moved to the garden and enjoyed years after their ‘container life’. If your region is prone to freezing temperatures, try to choose shrubs that are at least 2 planting zones lower than your normal zone – since the soil in containers freezes much quicker than the soil in the ground. 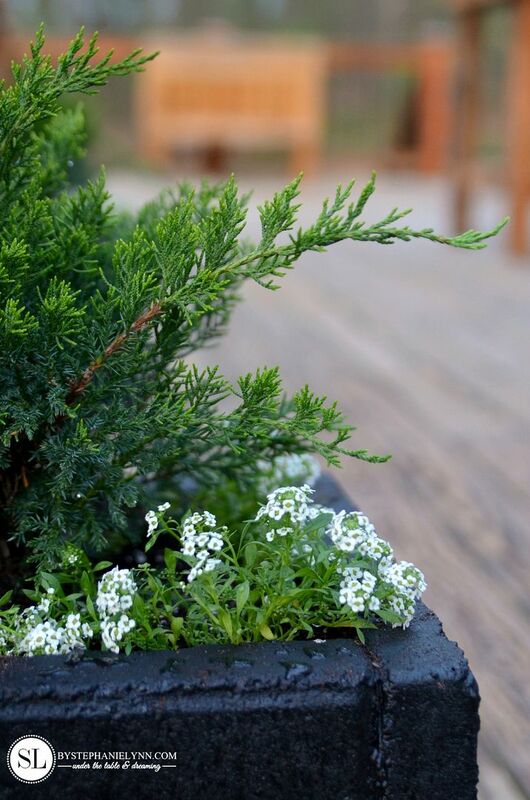 This year we planted a mix of Sea Green Junipers and White Alyssum. Compact evergreen shrub with multi-stem fountain-like, arching branches. Lush green foliage is attractive year-round. Well branched plant producing dense clusters of flowers all summer long. 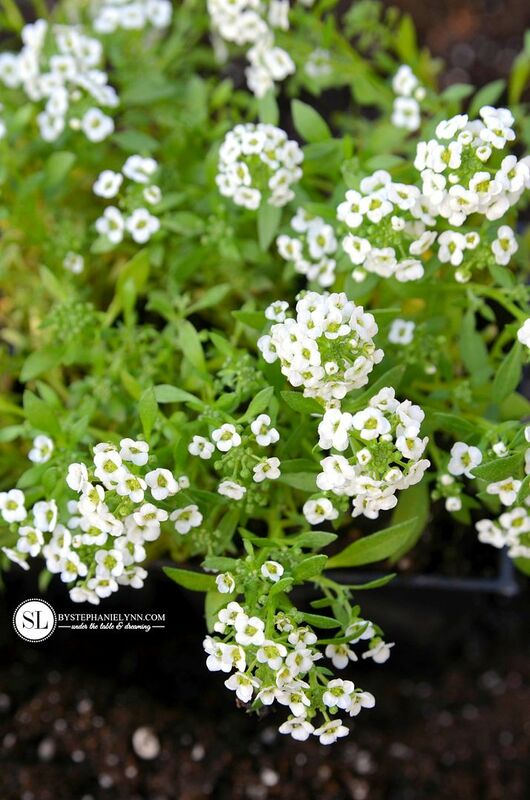 Fast growing, mounding carpet, perfect as a container filler – with a creeping habit – doubling as a spiller. Sweet smelling flowers attracts beneficial insects, butterflies and pollinators. 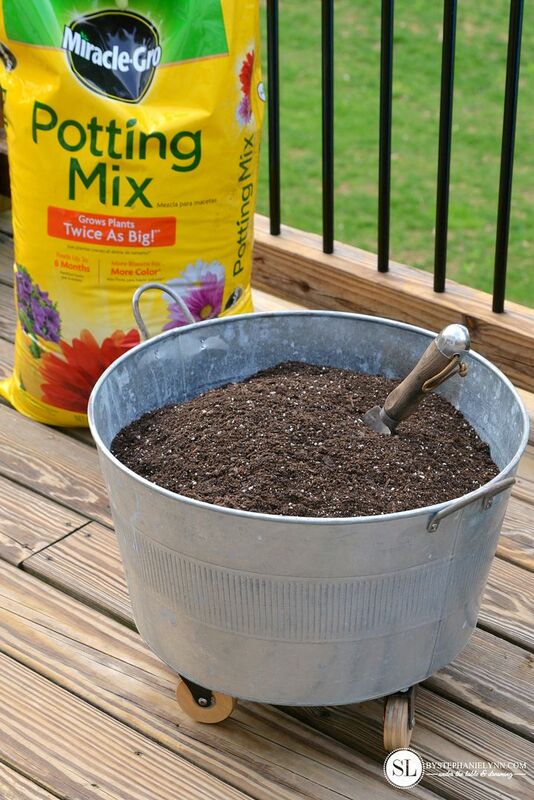 For plants to grow a healthy root system, always use a premium potting soil specifically formulated for containers. 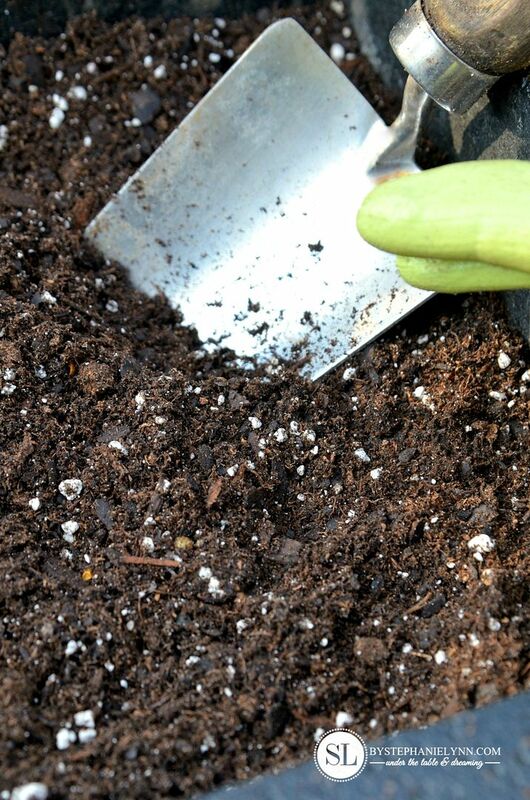 A good potting soil (or potting mix) will provide the perfect balance of air space, moisture retention and nutrition for the roots of your plants. 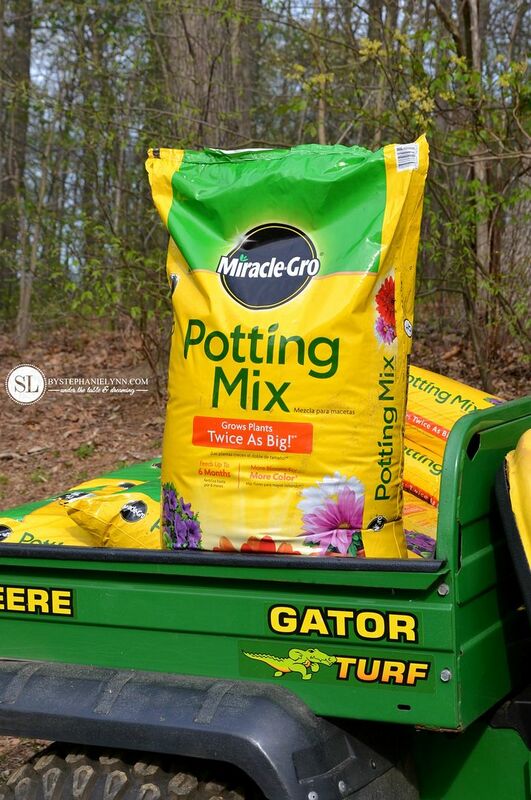 like Miracle-Gro® Potting Mix, which feeds up to six months. Though during the summer, with hot weather and frequent waterings – a regular feeding program should be started thirty days after planting. Since there is a lot of container planting going on, our rolling galvanized tub is always filled with potting mix this time of year. The tub is another simple diy that has stood the test of time. It keeps the potting soil contained and much easier to move around when planting. Make sure the container has adequate drainage. Gently loosen the root ball and carefully untangle any bound roots at the bottom. 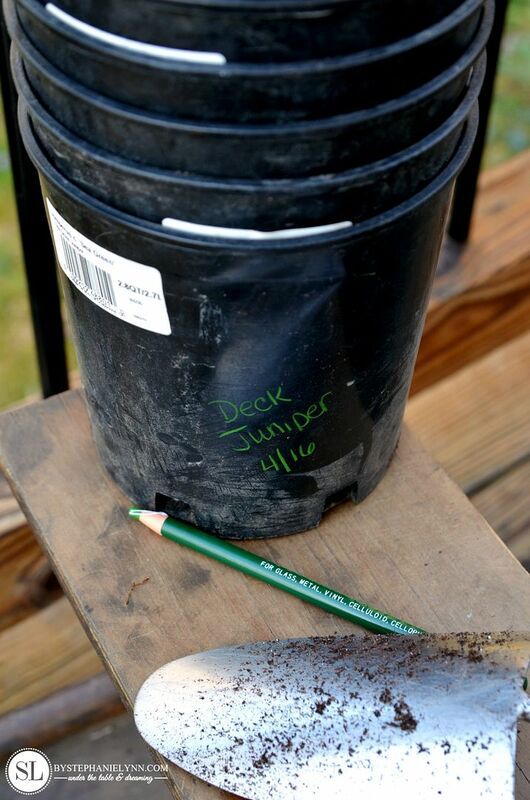 Water the container and allow it to drain, then top off with additional soil if any settling occurs. We have gotten into the habit of labeling the pots – since this is where the barcode generally tends to be located – if there is ever a need for returns. 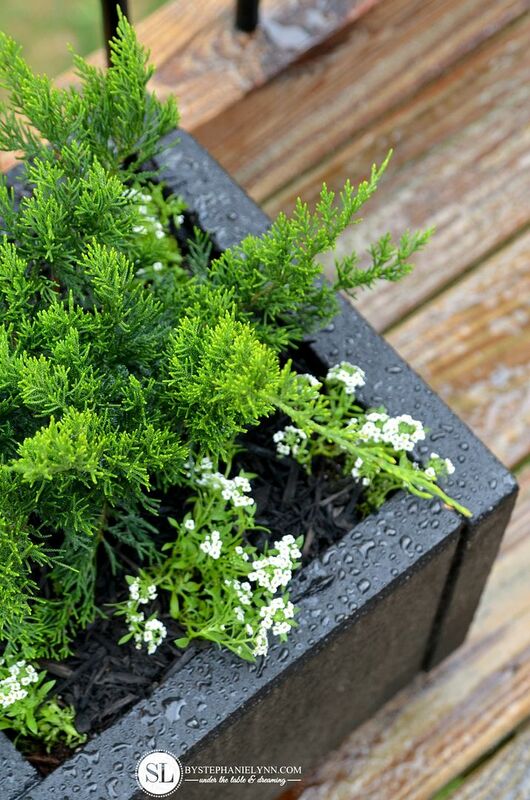 Container planting have a tendency to dry out very quickly so be sure to water them on regular basis. Evergreens do not show their stress quickly. During the excessive summer heat they may need to be watered daily. 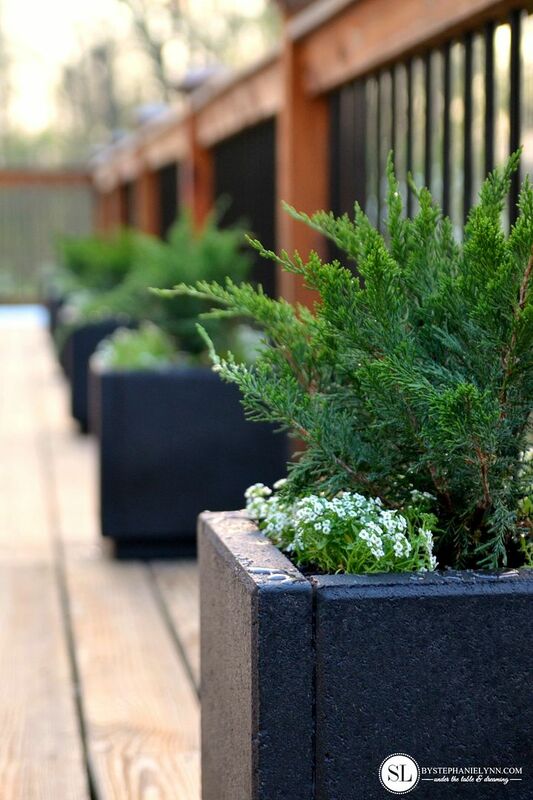 which is particularly important when Planting Container Evergreens. 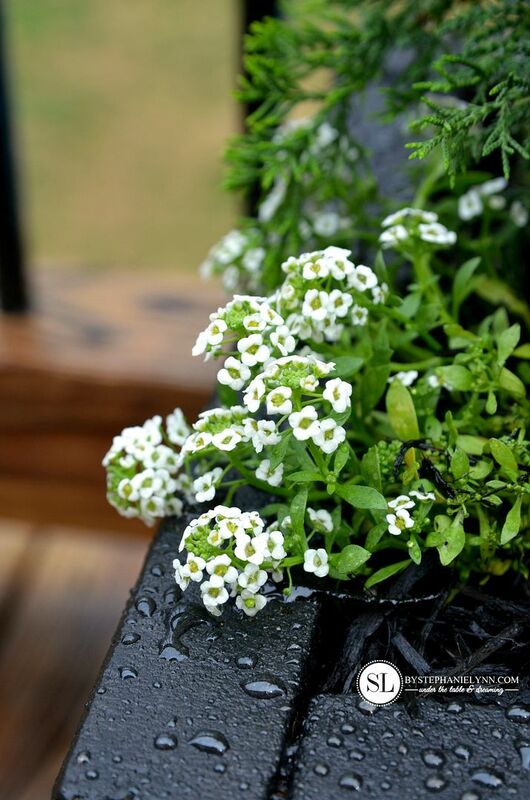 Since we are working with smaller sized planters, the shallow root system of Alyssum pairs well with the Juniper. Although the flowering blooms appear to be delicate and dainty, this hearty annual is very tolerant of heat and drought conditions. As it grows, the sweet fragrant flowers will not only mound to fill any empty spaces in the container, but spill over the edges creating a soft, billowing look. 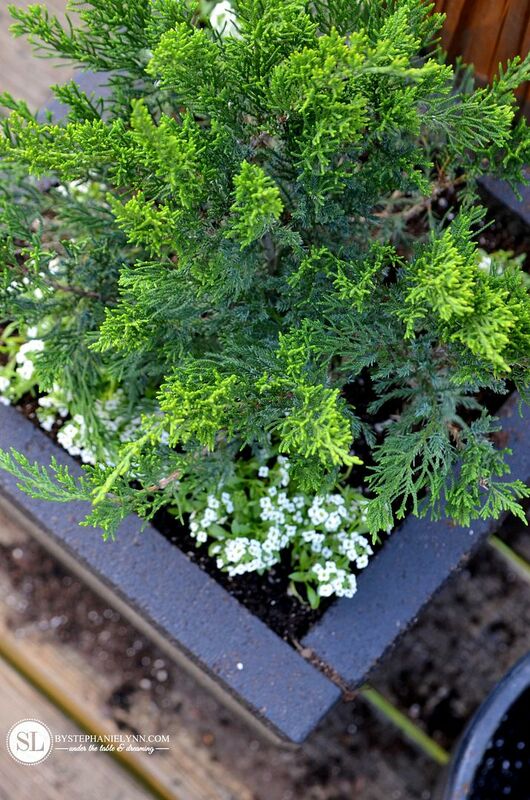 Planting Container Evergreens has year-round rewards. 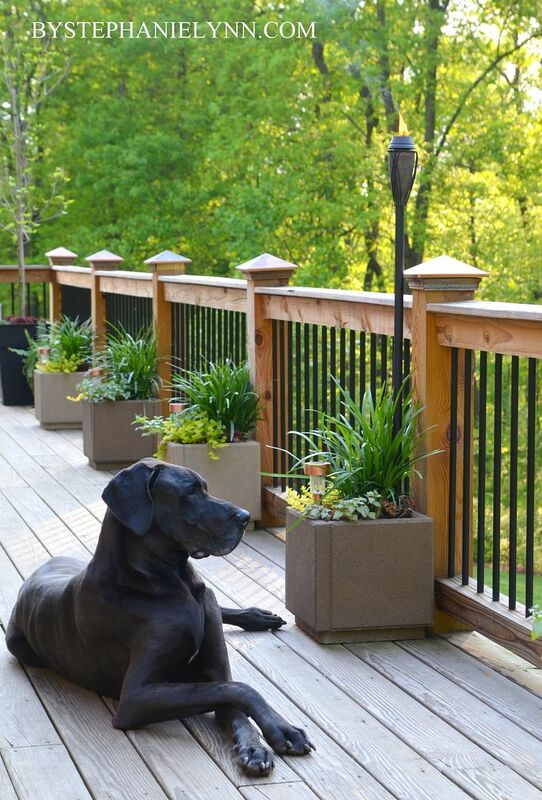 We have used several different varieties on our deck year after year that not only create various focal points, but help define each little section of our outdoor space. 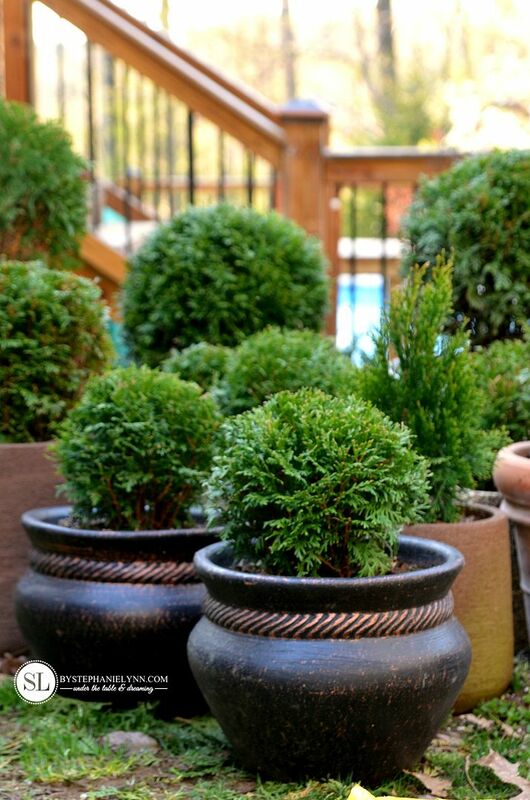 Have you ever considered Planting Container Evergreens? then sit back and enjoy the beauty – all season long.